Embellishments like tablecloths, covers, and runners are a beautiful and affordable way to give a distinctive look to event tables. 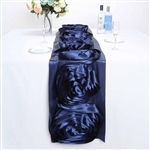 These runners also help to cover unsightly parts of the event tables. The runners smartly cover & conceal signs of abrasion or general wear & tear. 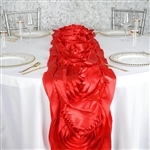 Further, they can be chosen in any shade that complements the event’s overall décor or theme. 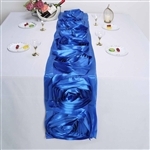 These large rosette runners can be matched with event tables or accessories like chair sashes and napkins. 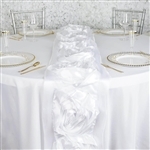 Professional decorators, party planners, and event organizers use these embellishments to decorate banquet tables to create a romantic atmosphere. From restaurant and hotel managers to casino and spa operators, people who are in the business of managing guest-hosting spaces trust the grace of rosette design on these bulk rated runners. 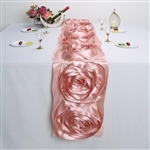 Transform your event décor into a breathtaking setup with this exclusive collection of rosette table runners. These runners stand apart from the usual crowd of predictable table accessories. 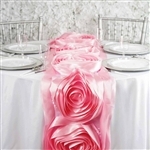 The rosette pattern is about floral charm that adds a new vibe to any event table. The visual effect is almost immediate. Rosette pattern complements the most event décors, easy to pair with venues dressed in a grand way or those wearing a minimal look. This is why property managers from all walks of life and event planners trust these runners to add that missing layer of beauty to dining tables. The overall effect is dramatic but in a restrained, appreciable way. Plus, the fabrics used are durable and don’t need much caring. 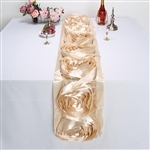 The carefully layered sewing underlines the premiumness of these rosette runners. Why buy event hosting supplies like Table Runners from RazaTrade?